I absolutely love decorating pumpkins! Fall is my favorite season by far, and adding fall touches all over my house puts me in the best mood! 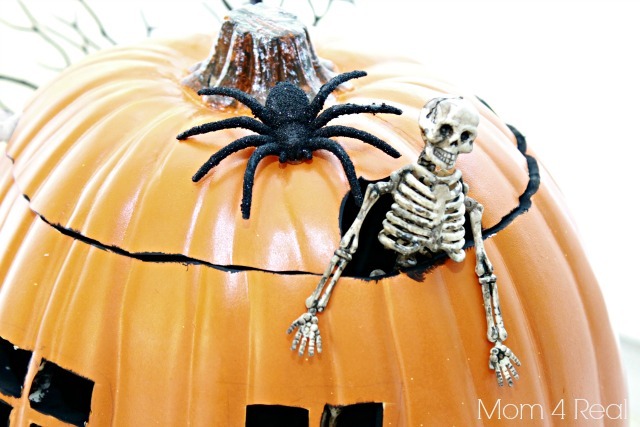 I decorated these pumpkins last year, but since there are so many new readers here and it’s still a little early for real pumpkin carving and decorating, I thought I would share this post with you newbies and also maybe just remind some of you that have been hanging out here for a while of their cuteness ;) So, without further adieu…here are 3 Pumpkin Decorating Ideas Using Foam Pumpkins! Are you ready for some pumpkin decorating???? I know I am! 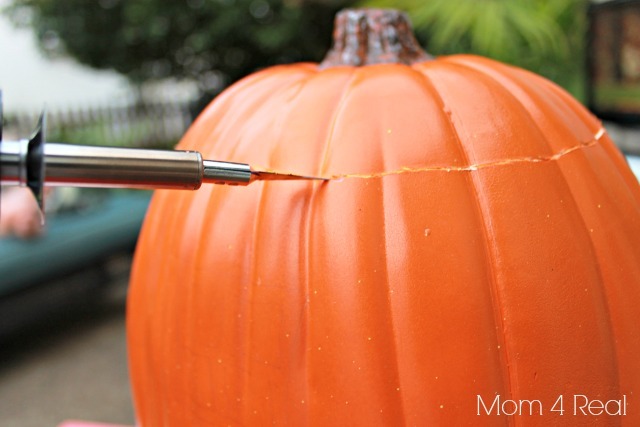 Well, I’m going to show you 3 fun ideas for decorating pumpkins! I love Fall…like, love love love Fall! 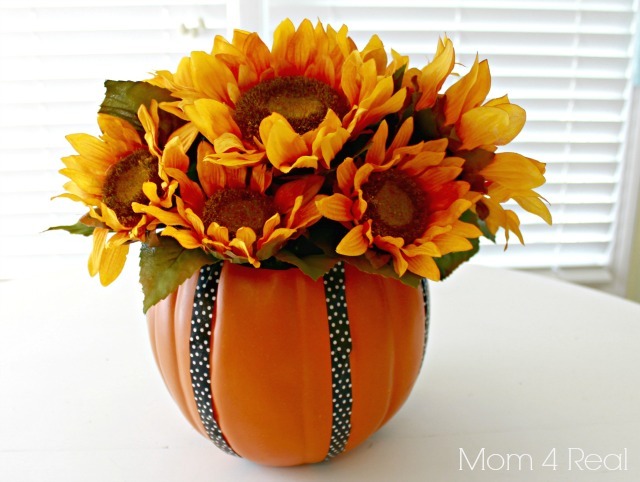 Pumpkins, mums, football, orange, falling leaves…need I say more? This year I’m getting a jump on my pumpkin decorating with some awesome foam pumpkins or funkins from Michaels! These little babies are amazing and won’t rot…woohoo for that! Wanna see what I did? I started with this fun haunted house pumpkin…isn’t it spooky? I simply used a heat knife (shown below) to cut the top off and cut the windows and doors too. This tool is absolutely amazing, allowing you to cut through the foam like butter! I picked up some fun embellishments from Michaels…skeletons, spiders, skeleton hands, a black tree looking twiggy thing, and even a coffin! I painted the inside of the pumpkin black and painted the insides of the window as well. I want to be able to put a battery operated flashing votive inside so it will glow when placed outside at night. I also cut a few holes in the lid so I could hang a little skeleton peaking out of the side…isn’t he spooky? The second pumpkin I worked on is based on one I did last year but didn’t post…I called it a mumpkin! I put a mum in the one I made last year, but decided to go for sunflowers this time. I simply removed the top with my heated knife, placed a foam block inside, then poked faux sunflower branches into it. 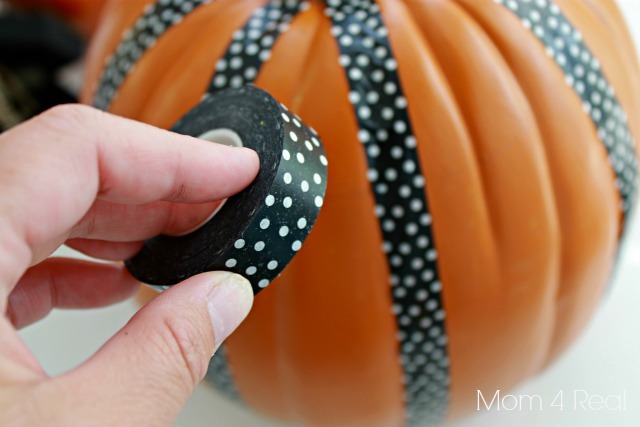 I used black and white polka dotted washi tape to add some fun detail to the pumpkin…the great thing about the washi tape is that if I decide I want to change it up, then I can just remove it! The third is my favorite! 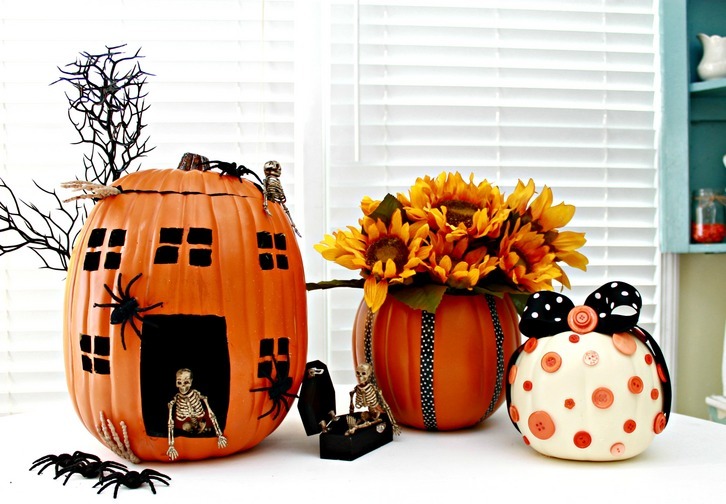 I love polka dots, and I adore buttons, so I thought…what about a little polka dot button pumpkin? I just hot glued the buttons in a random pattern all over this little white funkin, topped it with a black and white polka dot, and just sat back and smiled. Aren’t these buttons just gorgeous??? 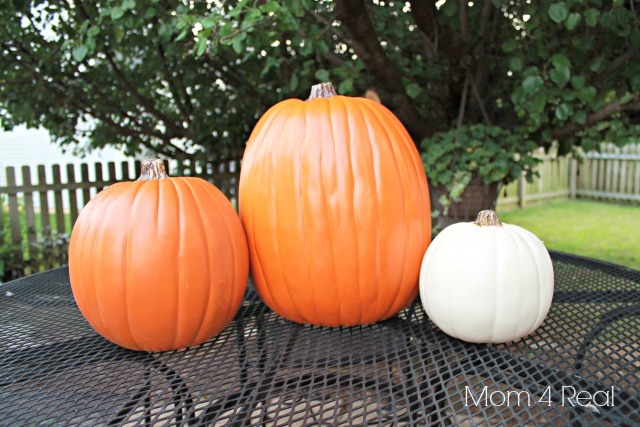 These were the foam pumpkins that I started with from Michaels…they come in a large variety of shapes, colors, and sizes! And the fabulous cutting knife….ahhhhh, cuts like buttah baby! So, what do you say? Are you ready for some pumpkins??? I’m sharing mine at the Craftaholics Fall Frenzy 2014! This post was sponsored by Michaels, all opinions are absolutely real and 100% mine! Which one is your fave? I definitely think mine is the Button Pumpkin? Pin it to save and make your own! « Keep It Clean Friends…Wet One’s for Back to School! Adorable! I love them all!!! The third id my favorite too…but ALL so cute! I LOVE LOVE LOVE fall too!! You just Spooked me out… and wow-ed me with cuteness..all in the same post! This is why I love Mom 4 Real.. Awesome stuff lady! Way to rock those pumpkins! I absolutely love that skeleton poking out of the top. And the details you put into the haunted house pumpkin. Love! Love them…. I’m going to TRY and make the haunted house style one with my 10 year old son… he loves getting creative and that’s right up his alley! 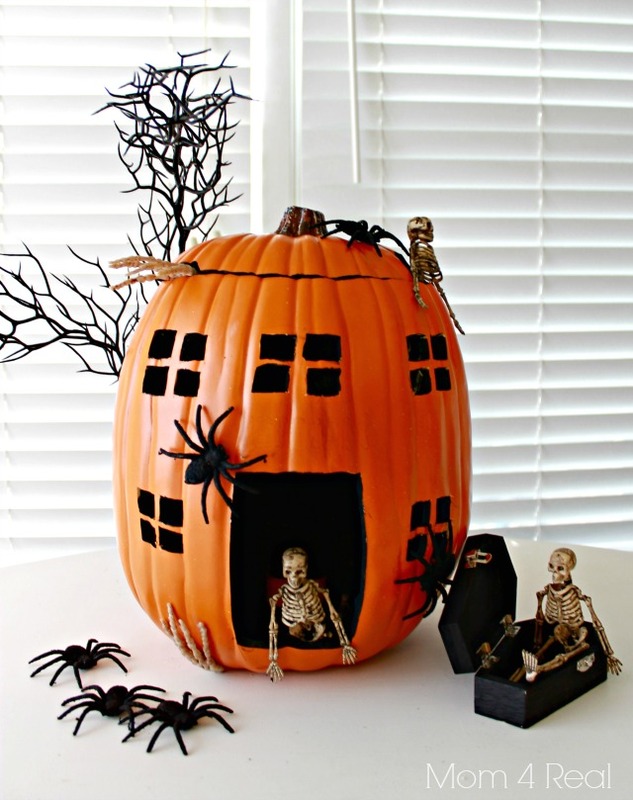 Great ideas–I especially like the haunted house pumpkin. Have googled the heat knife but have not found one that looks like the one you used. Could you please let us know where you got it? Thanks in advance! Thanks, Beth! The heat knife is from Michael’s Craft Store, and it is amazing!!! Cuts like butter! I love the one with the buttons! These are so adorable! I love them all. Where did you get the orange buttons? These are adorable. I love them all! Where did you get your orange buttons? Love the button pumpkin! I just painted dots on a mini pumpkin but now I think I know what to use my orange buttons for! So cute. I love the skeleton funkin. Gave me a giggle. Hope to find a heat knife at Michaels, I’ve never used one. Thanks for posting. Hi Jessica! I love these SOOO much, they look fantastic! 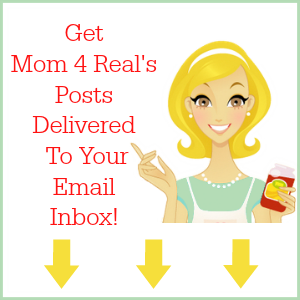 Thank you so much for sharing – pinning and sharing! Hope you had a fantastic weekend and happy Monday! Thanks, Christy! I bet it would be pretty easy…if you do it, send me a pic! I would love to see it!! Those are all super cute Jessica! We are really late at carving this year and just started today, but when we tried to cut into our pumpkins, they were so hard that we could barely get our sharpest knife in them! I’m so disappointed…I really wanted to use your pumpkin for inspiration. I ended up drilling a bunch of holes in mine instead boo! Love these cute pumpkins! My favorite is the little one with the buttons and bow! Thanks for linking up to the “Get Your DIY On” link up party! Come on back on Sunday for our burlap challenge!